Four Seasons at Smithville offers great amenities and clubs that keep active adults busy all year. 2017 was a banner year for 55-plus home sales in New Jersey. According to internal data from 55places.com, New Jersey was the second highest-selling state in the country. Among the best-selling communities in New Jersey was Four Seasons at Smithville in Galloway. The 1,215-home community was the seventh highest-selling community in the state, according to 55places.com. In 1998, K. Hovnanian began construction on the single-family and attached homes in the community, which were completed in 2006. Townhomes in the community range in size from 1,281 to 1,412 square feet, while single-family homes start at 1,480 and top off at 2,312 square feet. What sets Four Seasons at Smithville apart from the many other age-restricted community choices in New Jersey? According to 55places.com agent and community resident Ellen Stanavitch, the secret to its success lies in its location and amenities. Another big appeal to active adults is a low homeowners’ association (HOA) fee. “The monthly HOA fee is low in comparison to several other nearby communities, which is a major factor in their decision,” says Stanavitch. In terms of amenities, Four Seasons at Smithville is home to a 23,000 square-foot clubhouse with a state-of-the-art fitness center and aerobics studio. Also inside is a ballroom, card room, billiards, and indoor pool. 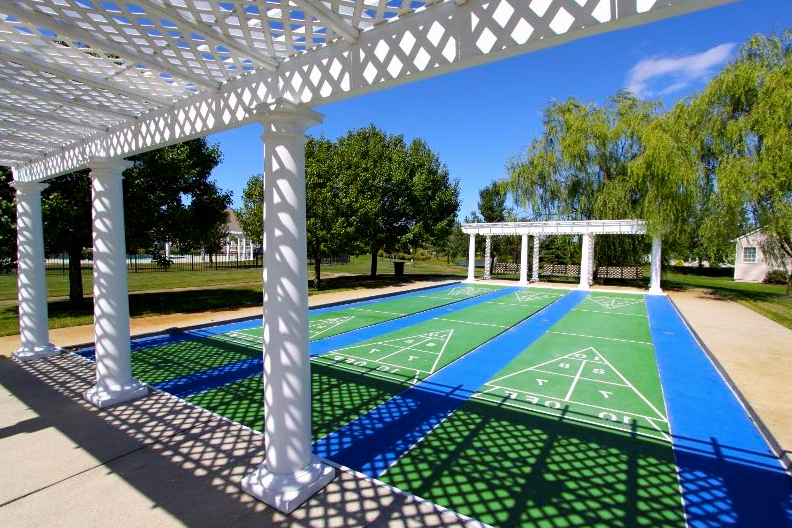 Outdoors, homeowners have access to private amenities like a pool, tennis courts, bocce ball courts, shuffleboard courts, a putting green, and walking trails. One of the biggest draws to an active adult community for those 55 and up is living an active lifestyle with their peers. Four Seasons at Smithville’s lifestyle has become one of its most unique and impressive aspects. There’s a group or club that piques the interest of any homeowner in the community, including art group, book club, photo club, knitting and quilting club, and veterans club. The community is also home to several events like fashion shows, holiday parties, gambling nights, bingo, cards, and darts. A favorite among residents is the planned trips they can take together. “I love living in Four Seasons as I have made so many friends my own age that I get together with even outside of the clubhouse. We are able to go to local theaters, have dinner, take trips to the Caribbean, spend the day at Monmouth Park Racetrack, spend an evening in Atlantic City, or just get together at our homes for an evening of fun,” according to Stanavitch. Stanavitch has no regrets over her decision to purchase in the community, which should come as no surprise. Despite being one of the hottest-selling communities in New Jersey and featuring over 1,000 homes, Four Seasons at Smithville still comes with the charm of a quaint, close-knit community. “I chose to purchase in Four Seasons after visiting many communities as I loved the location, convenience to beaches, shopping and restaurants, marina and medical facilities. I found the price of the homes were less than in other areas and absolutely loved the clubhouse. It is a lovely, quiet and safe community I am happy to call home.” Request more information on the homes, amenities, and lifestyle at Four Seasons at Smithville.